I have been looking for these since we moved to Maui 3 years ago. 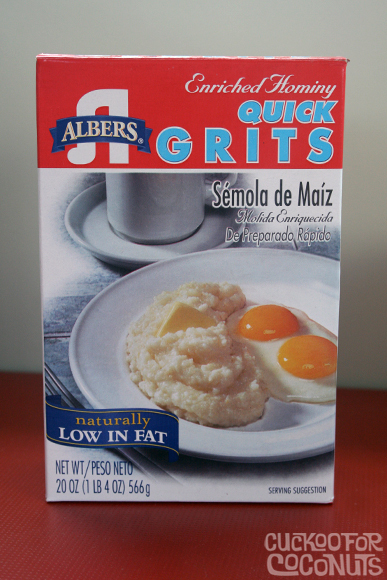 Sure we have polenta on the island but I have never been able to find Grits. I just happened to look up while I was browsing the candy aisle in K-Mart the other day and there they were. THE CANDY AISLE? REALLY? Can't wait to whip up a batch. I like mine with salt, butter, lots of pepper and a little sugar. Sometimes just cheese, salt and pepper will do. How about you? How do you like your grits... other than kissed? Any way I can get them! you know i have never had shrimp and grits. how about shrimp, cheese AND grits? That;s what mine was-shrimp, cheese and grits! But, I hear there are a million variations. And I can't wait to try 'em.